Federal Reserve Chair Janet Yellen kept interest rates at a record low, citing a weak economy abroad, low inflation, and instability in financial markets. Here’s what she had to say. JANET YELLEN: The outlook abroad appears to have become more uncertain of late. And heightened concerns about growth in China and other emerging market economies have led to notable volatility and financial markets. PERIES: To discuss why she’s keeping it low and if this is a good thing for us, I’m joined by Robert Pollin. He’s co-director of the Political Economy Research Institute at UMass Amherst. His forthcoming books is Greening the Global Economy, by MIT Press. Bob, as always, thank you so much for joining us today. ROBERT POLLIN: Thanks for having me on, Sharmini. It’s a pleasure. PERIES: Bob, this type of a monetary policy, quantitative easing, which is to keep interest rates low in order to stimulate the economy, is not working. In the past you have argued that it alone is not the best strategy. What more could they be doing in order to stimulate and grow the economy? POLLIN: Just to put this in context a little bit, the Fed lowered the interest rate that they have control over called the Federal Funds Rate, which is the rate at which banks borrow and lend on short term between each other. They drove that rate down to zero, effectively zero, seven years ago. So it’s been at zero. Banks can get money at zero interest, and have been able to for seven years. That was obviously a major response to the massive financial crisis created on Wall Street, and the great recession. Now, the policy has been in place for seven years. I think it has done some things in terms of offering funds in a limited way to various sectors in the economy. But let’s look at the evidence, and I think Janet Yellen is well aware of the evidence. What’s happened with the commercial banks. The commercial banks are now holding $2.5 trillion in cash. They get the money for free because the interest rate is zero. They’re holding the equivalent of 15 percent of U.S. GDP in cash. And they’re not lending it out. The whole point of the policy is not just for the banks to accumulate cash, but to lend it. So for example, the non-financial, the small business sector of the economy, the level of borrowing it’s able to do now, even now, is about half of what it was in 2007 before the crisis. This is after seven years of this zero interest rate policy. So what should we do instead? What we need to be thinking about is number one, taxing the excess reserves of the banks. Taxing them so that they create a disincentive for the banks to keep piling up this cash. The Fed has actually started to talk in very muted terms about that, but that’s one thing. Number two, instead of just thinking about a zero interest rate for banks, how about available, affordable credit for people that are going to use it for productive purposes? For example, for the small businesses. And another example, which we’ve talked about before, is getting funds to municipal governments. The Fed has the authority, the legal authority now, they don’t have to have any new laws passed in Congress, to buy municipal bonds directly from cities. So Baltimore. So Cleveland. Detroit. They can put out bonds, they can borrow money to, for example, invest in jobs for young people, to build a green sector, to invest in energy efficiency. They could put out bonds, and the fed could buy them at low rates. And that would be a direct stimulus for jobs, it would be a direct stimulus for the cities. PERIES: Bob, the Bureau of Labor Statistics just recently said that the unemployment rate is now at 5.1 percent. That sounds good, but we know that this does not represent all the people that are looking for work, are underemployed, or partly employed. What could be a better unemployment strategy combined with the stimulus of keeping the interest rates low? POLLIN: Right. The 5.1 percent is the official unemployment rate today, and that’s definitely better than 10.1 percent, no matter how you cut it. But here’s what it still means. It still means officially by that measure there’s 8 million people unemployed. As you also mentioned, the Bureau of Labor Statistics puts out another statistic, which includes people that want full-time jobs and have part-time jobs. So if you want a 40-hour a week job and you have 3 hours a week you are not counted as unemployed but you’re counted as underemployed. And what about people who have dropped out of the labor force? Add those all together. That adds up another 8 million. That makes us at 16 million. And on top of that, the number of people that have left the labor force relative to before the 2008 crisis. That’s another 6 million people. So we’re talking about 22 million people who are either unemployed, underemployed, or dropped out of the labor force because they didn’t see opportunity. So we still have a massive employment problem even though we’ve run this interest rate policy of zero interest for seven years. And on top of that wages have not gone up at all. Profits have gone up. The stock market has gone up. But wages have remained stagnant. So we still have a very weak labor market. In her own way I want to give Yellen, Janet Yellen credit for–she acknowledges this. Now, very few Federal Reserve chairs would acknowledge that when you have a 5.1 percent official unemployment rate. But Yellen is acknowledging it. The question is, what do you do about it? And the zero interest rate policy is better than not having a zero interest rate policy, but it is clearly far from adequate to generate new job opportunities, higher wages in the economy. PERIES: And Bob, I understand that you’re going to be having Janet Yellen coming to UMass next week. Give us a sense of what you might be saying to her in her ear. POLLIN: Well, maybe I’ll say to her what I just said to you. She is coming to give a talk, and to meet with faculty, which will be interesting to hear what she has to say, since it’s her first public appearance since the decision yesterday. But you know, basically I think that the real focus is in recognition of the limitations of this policy that they pursued for seven years. Of course the policy is supposed to stimulate the economy. You can’t–they can’t set the interest rate below zero. So this has gone as far as it can go. 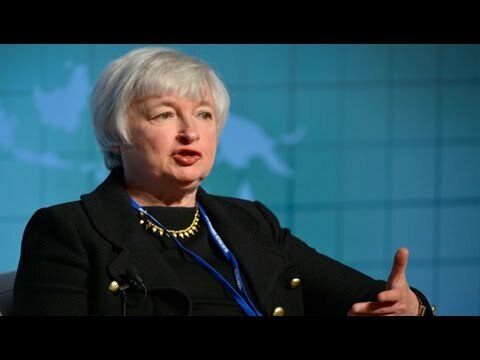 And what’s furthermore happened is of course that the global financial markets, the stock markets, have reacted negatively, not because they’re against the stimulus per se, but because they’re thinking that the signal that she’s sending, which is a true signal, that we still have a weak labor market in the United States, that there is a lot of instability in China, that emerging markets, in particular Brazil, are looking at a recession. And so Yellen in acknowledging this reality and saying therefore we need to keep the interest rate at zero, is telling the rest of the world that there’s a lot of problems left, and therefore at least for today the markets are reacting negatively. Stock markets have gone down by about 3 percent. PERIES: Bob, what could be a good policy that would assist in increasing the wages? POLLIN: Well you know, we need to have a tight labor market. That’s the first thing. That’s the most–a truly tight labor market. And how do you define a tight labor market? Let’s start to see average wages go up. When average wages start going up that means workers have more bargaining power. So we need to keep doing things to stimulate job creation and again, the zero interest rate policy is a stimulus. It’s just too weak. So you need something like more targeted credit expansion. For example, creating jobs in Baltimore or other cities, which the Fed can do by buying municipal bonds. Instead of buying U.S. government bonds that have already been issued and are on the secondary market, buy the new bonds that municipalities will put out, enabling the municipalities to expand education, to expand infrastructure investments, to expand green investments. That would be the single most important step they can take. Now beyond that, more generally, we have to start recognizing the role of the Fed to do what we could call development banking. To be more focused not just on serving Wall Street and the commercial banks, but on promoting productive investments in the economy and really focused on job opportunities. The fact is that the Fed is still talking about inflation as being a danger when there is no inflationary pressure in the economy. I think Yellen has been pushing against that, but we are still hearing this, including in the announcement yesterday. Well, they may raise the rates next month if we see inflationary pressures. Why not say we won’t raise interest rates and we’re going to do a lot of other things to get credit into the economy until we see wages going up commensurate with productivity. PERIES: Bob Pollin, thank you so much for joining us today. POLLIN: Thanks very much for having me, Sharmini.